A great suit - incredibly comfortable! While I was briefly saddened that wearing it didn't magically transform me into a Tennant-esque waif, the suit is beautifully put together and the attention to detail is outstanding. 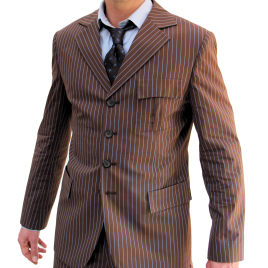 It's the best fitting suit in my wardrobe and I'm very much looking forward to wearing it to my new job next year. The cotton blend is light and extremely comfy to move about in. Fantastic. Indy was very helpful in answering my never-ending questions, always very promptly. The whole experience was really pleasurable and I look forward to ordering again in the near future!